De La Salle University (DLSU), De La Salle-College of St. Benilde (DLS-CSB), Far Eastern University (FEU) and San Beda College (SBC) are tied at three gold medals – the most number of gold medals won by a team. But the University of the Philippines-Diliman (UPD) topped in terms of total number of medals. UPD bagged nine, followed by DLSU, seven, and FEU, six. .
Visayas was the strongest from the provincial bloc, with Foundation University in Dumaguete City and Southwestern University (SWU) in Cebu ranking first in the beach volleyball men’s and women’s divisions, respectively. There were a total of ten schools from the Visayas and Mindanao that earned a spot in the top three, against Manila’s 13. These schools are: Central Philippines University (CPU), Holy Cross of Davao College (HCDC), Iloilo Doctors College (IDC), Mindanao State University (MSU)-Marawi, University of Negros Occidental Recoletos (UNOR), University of San Carlos (USC), University of St. La Salle (USLS), Xavier University (XU), FU and SWU. FU was also highest in terms of number of medals from Visayas and Mindanao at four medals, followed by USLS with three. The rest had one each. Policies of the UNIGAMES, however, provide “no official declaration of general champions.” Only in each sports and athletic event can the individual winners be announced and awarded, to elevate and centralize the competitiveness among teams to their individual sports. The championship match in badminton in the 15th University Games (UNIGAMES) became a reunion between two top contenders in a coveted sports tournament among Manila schools. Far Eastern University (FEU) and University of the East (UE) found themselves on the same level competition, albeit more intense, with the latter continuing to give justice to its title as champion in the University Athletic Association of the Philippines (UAAP) final badminton face-off. But UE had good luck on its side. 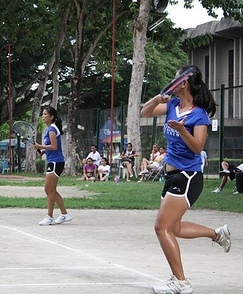 It beat FEU, becoming this year’s UNIGAMES badminton champion in the women’s division. Its performance was a stark contrast compared to last year’s which left them without any place. Coach Rocky Magnaye of UE felt the excitement himself. He said it was a “hard-fought championship” and admitted to finding their chances at winning slimmer, especially in the doubles division. But Magnaye was confident with their preparations. Even after the UAAP, they continued on conditioning their players and kept their focus on their sports program. He said even if all except one of his players are still in their first year of college, his team managed to maintain its competitiveness, owing also to the training that most of his players received back in high school. Last year’s champion in the women’s division, Iloilo Doctors College (IDC) also encountered a similar fate with UE’s women’s badminton team. It failed to show up in this year’s UNIGAMES due to financial constraints, automatically giving up on its chances at the win this year. UE’s victory also bled into the men’s division. It successfully smashed IDC outside the court, keeping it at the same second place it received last year. Xavier University and Adamson University both came in third place. Rizal Technological University (RTU) hit gold for its third successive year in the University Games (UNIGAMES) hosted this year by Silliman University in Dumaguete City. The 15th UNIGAMES witnessed RTU successfully defending its title against the Negros Occidental-Recoletos (UNOR) in its championship match this morning. It was also in Dumaguete City, when Foundation University hosted the UNIGAMES in 2008, where RTU bagged its first gold in sepak takraw. Coach Emmanuel Dayawon credits the win to their school’s support and the commitment of his team to training. “I thank God, the administration for their support, and the team for their hard work. Our players’ discipline made us maintain the title,” Dayawon said. Most of the players from RTU had competed in the previous UNIGAMES. This year’s University Games (UNIGAMES) pioneers in its 15-year history the playing of a sport that has given sophistication to the use of the bow and arrow. The suggestion of Silliman University, 15th UNIGAMES’ host, to include archery initially as a demo sport materialized with Visayas schools Silliman and La Salle University (Ozamiz) reinforcing the promise of the sport. 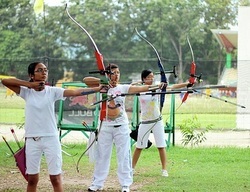 Silliman and other schools with archery in its sports program are, however, seeking for its inclusion as a regular sport on top of 14 others. UNIGAMES Corporation president Roger Banzuela said groundwork for archery to become a mainstay in the UNIGAMES has started, in support of this year’s present initiative. “We have asked the National Archery Association to campaign for participants, and they have responded to help us make it a regular sport in the next years to come. We remain optimistic for this to happen,” Banzuela said. For archery to be recognized as a regular sport, Banzuela said it has to sustain the participation of at least four schools – something that he foresee can be achieved with consistent marketing and promotional events. Banzuela said the country’s chances of making it big in the Olympics are with, with Filipino athletes’ top standing in international events. In fact, Silliman has produced already a number of internationally renowned archers, among them are Olympians Rowel Merto, Lisa Ygnalaga, Jennifer Chan and Mark Javier, who was the lone Filipino in the2008 Beijing Olympics. The lawn tennis championship matches this morning witnessed De La Salle-College of St. Benilde (DLS-CSB) strongly defending its title in one division and giving an easy win to its supposed opponent in another. As the 15th University Games (UNIGAMES) hosted by Silliman University nears a close, DLS-CSB holds on to its title as it earned its first gold following its victory over Ateneo de Manila University (ADMU) in the men’s division. DLS-CSB coach John Rey Moreno, who has been with the team for two years, considers their win a privilege. Pressure was mounting as ADMU also put up a good fight. His team, however, kept focus, ensuring an in every after hitting the ball. ADMU is this year’s first runner-up, followed by De La Salle University (DLSU), which slid by a rank from its standing last year. Meanwhile, the turnout for DLS-CSB in the women’s division did not make a repeat of its last year’s triumph. The team failed to participate in this year’s UNIGAMES, clearly putting off their chances at defending their title as champs. Moreno explained that “medical problems” caused DLS-CSB’s inability to join this year. DLSU won against ADMU in a super tie break that quickly pegged the scores at 10-4. Coach Pereme Jeremia Alina of DLSU said his team clinched this year’s title because of good preparation. “Our players did their best. The Ateneans played well, but we had the luckiest shots,” he added. With a leg barely able to move and a hand bearing traces of a painful accident just a week before the start of the 15th University Games (UNIGAMES), a junior Accountancy major from Silliman University never backed out from the game she has come to love since high school. Jelou Ann Tabanan breathed life today to what most say of chess: king of intellectual sports and queen of mind games. It was only on October 18 when she accidentally ran through a glass door during an event at the Negros Oriental Convention Center. She did not notice that what was ahead of her was a sensitive sheet of glass as she rushed to her boyfriend’s aunt who passed by the Center. “She felt like she was walking through a series of curtains when that happened, and only started feeling the pain while she was on the ambulance,” her teammate, Jhonevan Tampi, said. It was Tampi who brought Jelou to the hospital. The glass shattered all over Jelou. She sustained lacerations in her foot and hands. Doctors had to stitch the cuts on her body and scheduled them removed next month yet. Her teammates and parents advised her against joining this year’s UNIGAMES, but Jelou was determined to join. “I remembered a disabled Olympian chess player. In my mind, if he was able to do it, there is no reason why I can’t do the same even in my present state,” Jelou explained without any tone of regret. It was this passion for the sport which won her several tournaments that saw her compete in the first UNIGAMES elimination roundvfor chess on a wheelchair. With her fingers still bearing stitches, she moved the pawns like any sharp competitive athlete. Ateneo de Manila University (ADMU) braves for defending champ De La Salle-College of Saint Benilde (DLS-CSB) as it moved into the 15th University Games (UNIGAMES) lawn tennis men’s final round tomorrow at Praxevilla Tennis Court. It took ADMU four hours to secure its spot in the championship against De La Salle University (DLSU) during the semi-finals yesterday. It beat DLSU, 10-8. Coach Michael Mora III of ADMU is glad with the result but hopes for a tougher grip on their chance for the trophy in their final match against DLS-CSB. The slots for the semi-finals are clearly up for grabs among schools from only Luzon and Visayas, with Manila teams raking in most wins in the determining matches today. Central Philippine University (CPU) in Iloilo, Foundation University (FU) in Dumaguete, University of San Jose Recoletos (USJR) of Cebu and University of St. La Salle (USLS) in Bacolod are the lone teams giving a face to the Visayas bloc tomorrow. A more cut-throat fight is, however, expected between USJR and USLS, which belong to a similar bracket in the men’s division, as they compete over a common semi-finals slot. In the same division, FU goes up against University of the Philippines-Diliman (UP-D). In the women’s division, the Visayas bloc finds hope in CPU and USLS, which will compete against De La Salle University (DLSU) and National University (NU), respectively. The Eulogio "Amang" Rodriguez Institute of Science and Technology (EARIST) fell short of players but bagged the win in its game of sepak takraw aganst Colegio de Stanta Catalina de Alejandria (COSCA). It needed more than the home court advantage for COSCA to beat EARIST, which finished the game at 2-0, in its own gym. Only ten players, from an ideal 12, comprised the EARIST team. 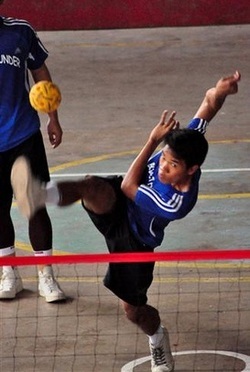 This was after one of their players got injured and another one disqualified because of present membership with the country’s sepak takraw team. But head coach Myrna Gulles said the team remains competitive and has already adjusted to playing with its present composition for this 15th Philippine University Games (UNIGAMES). 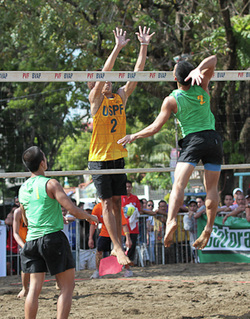 Gulles expressed confidence in advancing into the finals with their steady training and familiarity with Dumaguete City. EARIST competed in the UNIGAMES hosted by Foundation University in Dumaguete two years ago. This was the statement of Joseph Gensaya, assistant coach of the football team of Central Philippine University (CPU) as they blanked Ateneo de Manila University (ADMU). Kicking its way to the next level, the Central Philippine University hit the goal thrice this morning’s first football game, leaving behind ADMU with a zero. CPU dominated the ball possession since the beginning of the game. “It was a difficult game because ADMU is a big team with a big fighting heart, and are well prepared,” Gensaya explained. But CPU was unfazed. They faced the challenge head-on, despite two injured athletes. Being able to make it to the quarter-finals two years ago, the CPU football team’s goal is to break their own best finish and make a good showing for their school. Gensaya, alongside another Korean, is the assistant coach to Dr. Pee, who served as an eye-opener for CPU to give sports equal emphasis as academics. CPU’s present team composition is far different from the previous years’ team, with eight Koreans and seven Filipinos. Keeping their optimism up, University of San Jose Recoletos’ (USJR) Spiking Jaguars, last year’s second best team, topped Ateneo de Manila University’s (ADMU) Blue Spikers in a 3-0 match in today’s second game at St. Louis School-Don Bosco for volleyball men. After three sets of heart-stopping saves and spikes, the ADMU never failed to wow the crowd but ended up lagging behind the USJR. Coach Grace Antigua of USJR said, “teamwork, good communication in the court and good strategy” is the team’s best asset. She admitted though that because “our players were already confident” by the third set, which caused them to be lax, ADMU almost caught up with them. USJR is the defending champion of the recently concluded Cebu Schools Athletic Foundation, Inc.
VALENCIA, NEGROS ORIENTAL – The Ateneo Blue Spikers finally met its match, falling 3-0 to Foundation University in the fourth men's volleyball game today at the Valencia gym, leaving spectators in awe after a tension-filled 3-straight-set-match. The Ateneo Blue Spikers tried to catch up with the Greyhounds as the latter consistently returned powerful attacks right from the game's get-go. Perceived as one of the celebrity teams, the Blue Eagles failed to wow the crowd due to the unexpected performance of the roaring Greyhounds. A known champ in Dumaguete City, the FU Greyhounds proved their strength, showing dominance over the opposing team by the time they got in the court. FU didn't only get the cheer of the crowd; they also got the attention of ADMU’s perceived rivals, UP-Diliman players, especially when their team captain, Arnel Amadeo, executed powerful spikes. It was after clinching the championship trophy in a local badminton tournament that she earned a slot in her school’s delegation to the 15th University Games. But her winning streak was cut short when her health condition proved her first game during the eliminations to be her last. 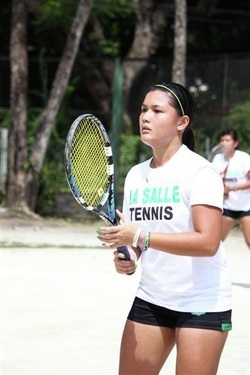 St. Louis University (SLU) of Baguio’s 16-year-old Chastine de la Cruz gave her opponents a tough fight in a badminton game against Adamson University (AdU) today at Hypermart, Dumaguete. She was the highest-pointer during the first set. Not obvious to her opponents, de la Cruz was already having mild back pains as she played into the third set. She kept her determination up, but gave in right after the game, hitting the bench belly-down. De la Cruz explained the back pains did not cause her fighting spirit to waiver. “I had nothing to lose. Since I was already there, I told myself: Why not continue?” de la Cruz said. The medical team, after examining de la Cruz, recommended that she be brought to Silliman Medical Center, where she underwent an x-ray examination. Many believed that she suffered from scoliosis – an abnormal lateral curve to the vertebral column. But medical results showed no sign of the said bone condition. Joey Jocson, coach of SLU’s badminton team, explained that de la Cruz only experienced severe back ache brought about by an excessive amount of stress and muscle pain. Jocson, in response to comments that de la Cruz should have presented a medical certificate, said there was no need for one as de la Cruz had even come from the Baguio Badminton League championship where her team won against the University of the Cordilleras. While results of the medical examination already ruled out scoliosis, Jocson has decided to pull her out of the next rounds to allow her to fully recover. As of press time, de la Cruz is recovering in the Roble Hall of the College of Nursing of Silliman University under the supervision of the Wellness Committee head Florenda Cabatit. She will stay under Cabatit’s care until her condition stabilizes. De la Cruz hopes to get back to shape before October 29, their departure for Baguio where she will take a break from playing badminton for one semester. The University Games ( UniGames ) started in 1996 in Bacolod with a single event, volleyball, after all, founder Roger Banzuela used to be president of the Philippine Amateur Volleyball Association ( PAVA ), but eventually, grew and grew both in terms of events, schools, and participants. This year's staging, backed by the Philippine Sports Commission and hosted by Silliman University and both the provincial government of Negros Oriental and the City of Dumaguete, attracted close to 3000 athletes coming from 47 schools from Luzon, Visayas, and Mindanao and competing in 13 regular events already plus the demo sport of archery. And the way it has been turning out, the UniGames has become a mix of everything aside from being an athletic meet, a reunion of former national athletes and coaches, same for former teammates and a junket or perhaps a vacation would be a the better term, but do not tell that to the athletes who compete with the same dedication that they show in their regular leagues back home. The fact is, for Metro Manila schools, no more Team B's the past years, the credibility and popularity of the league has grown and schools have been sending their NCAA and UAAP teams, providing a much-anticipated playing opportunity for provincial teams, as the story goes, there was one provinmcial school which beat the De La Salle team from Manila in a basketball match, and so what if it was La Salle's team B , the winning school had a giant streamer made proclaiming to the world the fact that it beat La Salle, for a year, the streamer stayed there, even replaced when a typhoon destroyed it. Dasmarinas went home with one in the 2009 edition held in Iloilo City. The fact that this year's UniGames also happened at the heels of the annual Buglasan festival of the province added to the spectacle and experience available to the visiting athletes. opportunity to my bench players to prepare them for future competitions, " even as he denied that he also goes there to scout and recruit for new players, Black is going for his 3rd straight UniGames championship. His Blue Eagles gave a basketball lesson to the Mindanao State University-Marawi players who were still hap[py after losing 42 - 92. Falcons, Bert Flores, for FEU, and even Eric Alatamirano who was watching his son now playing for Ateneo, former Shell PBA trainer Hercules Callanta who is here with the Lyceum Philippines University where he is a consultant and is looking forward to next year's NCAA already, Callanta was also here for the first UniGames Sports Science seminar held two days before the formal games' opening..Non-basketball personality always in the UniGames even on his own is Vip Isada, a former personality in the local racing world, but is here with UP-Diliman's volleyball teams.. Indeed , the UniGames has become a mix of everything and everyone. A logo is a graphic representation of a set of values that usually characterizes an organization. In the case of the 15th University Games (UNIGAMES), it speaks of fair play, friendship and top-caliber competition. Designed by Jutsze Pamate of the College of Performing Arts of Silliman University, the 15th UNIGAMES logo builds its collective identity on three individual yet complementing symbols. These symbols take on the following interpretations. 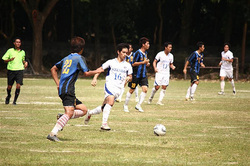 UNIGAMES is the only national collegiate sports competition organized by the UNIGAMES, Inc. in the country today. 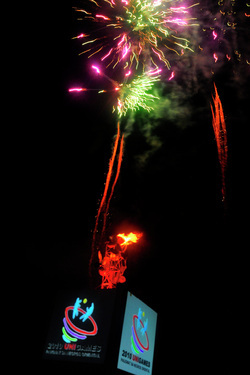 It was first held in 1996 at the University of St. La Salle-Bacolod City, its founding host. The goal is to gather the finest varsity athletes from private and government universities from all over the country in one sports event. Through the years, the UNIGAMES has provided a continuum of opportunities for student-athletes in the various national teams representing the country in the Olympics, the Asian Games, Southeast Asian Games and other international sports competitions. VALENCIA, NEGROS ORIENTAL – Last year's third placer in women's volleyball , Adamson University, once again proved that they deserve a spot in the 15th Philippine University Games (UNIGAMES) as they won their first game against Foundation University at the Valencia gymnasium today. Minerva Dulce Pante, head coach of the AdU Lady Falcons, projected a very relaxed aura right from the start of the game up to the finish. Having the spot to defend, the Lady Falcons pulled their best in every set, obviously manifested in every spike that each of the players executed. After 3 consecutive sets, the FU Greyhounds bowed to the Lady Falcons, 25-15, 25-10, 25-9, in the first game. Following FU-AdU was the DSLU-SLU match, one which also put the spectators in awe as DLSU's team captain Stephanie Mercado got onto the court and waved at her fans while everyone else was introduced to the crowd. After the first whistle of the referee, signaling the beginning of the match, people were already shouting the names of their idols, while others are waving their banners to show their full support. After losing the first game to the Lady Falcons, the FU Greyhounds were back once again to put up a fight against MSU-Marawi. On their second attempt, the Greyhounds dominated the 1st set of the match with their new strategy. However, in the second set, their level of performance was overpowered by MSU's unexpected attacks and defensive blocks. FU was not able to sustain their momentum from then on until the fourth set, making MSU win and FU losing their last chance. After completely losing her temper, Ms. Enriquita Aday, coach of the FU Greyhounds, hit the team captain on the stomach and shouted at all the other players. Even on a Sunday, people from Valencia and supporters from the neighboring towns never failed to come and witness their respective team idols as they pull their best in their different matches. The opening games at the Valencia gym today not only made people gather, in fact, it even made them talk. ZAMBOANGUITA, NEGROS ORIENTAL – The basketball game between Foundation University (FU) of Dumaguete City and Holy Angel University of Pampanga (HAU) today turned sour after a contested delay in the blowing of the whistle to indicate timeout. FU won by a point, 81-80, over HAU in a basketball game this morning at the municipal gymnasium here. Before the game came to a close, however, a disagreement ensued when the last ball shot by HAU was not counted. Table officials explained the shot was made beyond the one second left to conclude the game. But timeout was only sounded off at the third second, following the power outage that forced the table officials to be resourceful in using the stopwatch in their cellphone as an alternate to the electric-powered digital stopwatch. While the cellphone read the exact time, the blowing of the whistle was not synchronized with it. Basketball tournament manager Rolando Marañon explained and rebutted the claim of HAU that it was able to make the shot within the time left. “How can you possibly dribble and shoot a ball in one second?” Marañon stressed. On the part of HAU, basketball player Miguel Paolo Pine said there could have been a better backup plan. “A battery-operated digital stopwatch should have been used, instead of a cellphone. And it was hard for us to monitor our points after the brownout because there was no manual scoreboard,” he said. The game picked up momentum at the end of the third quarter when FU started to catch up, scoring 55 points against HAU’s 60 points. FU will have their next game on October 26 against National University of Manila. De La Salle-College of Saint Benilde (DLS-CSB) and De La Salle University (DLSU) -Manila won over Holy Name University (HNU) and Silliman University (SU), respectively in two tennis divisions for men. Playing in the first singles men division, DLS-CSB’s Mark Daniel Bautista accumulated a final score of six points over HNU’s Darrhen Olala who got four points. 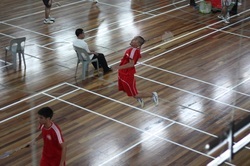 On the other match for the singles men, Ernesto Pantua III scored six points over SU’s Rey John Tumbaga who got two points, during the third set of the game. Meanwhile, for the doubles men division, DLS-CSB gained another win with Larry Antigua and Martin Ramos raking in six points against HNU’s Zenel Boca and Marlon Castro who got one point. Silliman University held today an orientation for all coaches and referees from different participating schools in the weeklong 15th Philippine University Games (UNIGAMES) which will officially open tomorrow afternoon. The orientation introduced the various committee heads to the participants and encouraged them to immediately endorse their respective concerns to the appropriate committees to ensure prompt action. UNIGAMES 2010 Co-convenor Jose Mari Jonathan Antonio also informed the participants about the “Ikot Jeepney” program which offers free transportation to the delegates from their billeting stations to the playing venues. These jeepneys service designated routes every five minutes within 6:30 AM to 9PM. Although the turnout of 56 schools from around the country does not meet the original target, UNIGAMES president Roger A. Banzuela said he is “very happy” with the preparations for this year’s UNIGAMES. Banzuela noted how some schools had to back out because of the semestral break and the high cost of airfare to Dumaguete due to late bookings. He, however, said he is satisfied with how Silliman helped make travel arrangements for the delegates. He remains optimistic that the more popular games, like basketball, will attract more people in the audience. Started in 1996, the UNIGAMES, Banzuela said, is hosted in provinces in order for tertiary schools in the Visayas and Mindanao to meet up and play with the teams from Metro Manila. He added that UNIGAMES is always conducted in the spirit of fair play, friendship, and top-caliber competition. Excitement for the opening of the 15th Philippine University Games (UNIGAMES) on Sunday builds up as the number of participating schools from around the country increases to 56. Registration at Silliman University, this year’s UNIGAMES host, started as early as October 20. Over 2,300 delegates have confirmed participation, including the usual top contending teams in Manila. Holy Angel University in Pampanga, Brokenshire College in Davao and National University, De La Salle University and Far Eastern University in Manila were the first five schools to have registered on campus. Today also ushered in a making in the history of the UNIGAMES with the hosting of the 1st UNIGAMES Sports Science Seminar at the Multimedia Center of Silliman University. Sports science is a study of the use of scientific techniques in improving athletic performance. It covers sports nutrition, physiology, psychology, and fluids. The seminar had Alfred Manguiat (Bodivance / HDI Presentation), Nino Sinco (Fluides Guidelines for Sports Performance)\, Luz Callanta (Basic Principles of Sports Nutrition) and Hercules Callanta (Training and Conditioning for Sports). Commissioner Joaquin “Chito” Loyzaga of the Philippine Sports Commission was present at the seminar and gave words of encouragement to the participants who were mostly coaches and officials from the different participating schools. “This is the first in the UNIGAMES, and this will be part of it,” Loyzaga said, expressing support for the inclusion of similar such seminars in the UNIGAMES and the eventual integration of sports science into the academic curriculum. 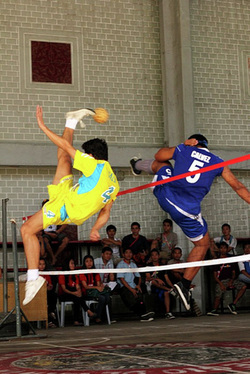 The UNIGAMES, which is largely supported by the provincial government of Negros Oriental and the city government of Dumaguete, offers 14 sports events. These events are spread across the Silliman campus and sports facilities in the partner universities and local government units: Asian College of Science and Technology, Colegio de Santa Catalina de Alejandria, Foundation University, Negros Oriental State University, St. Paul University, Dumaguete City and the municipalities of Valencia and Zamboanguita.